This collection of essays from The Believer covers a wide and quirky range of topics. There’s an essay by Eula Bass that explores how the novels of Laura Ingalls Wilder presage current questions about gentrification. Rick Moody profiles the offbeat Christian band Danielson Famile, and Ginger Strand examines the American aquarium boom. “Transmissions from Camp Trans” by Michelle Tea is about Tea’s week at a gathering of trans women held near the Michigan Womyn’s Festival, which bars trans women from attending, and “Waiting for the Bad Thing” by Sam Lipsyte is about the author’s road trip through California with Michel Houllebecq. I found that the essays I most enjoyed fell into one of two categories: Either they analyzed something I was already at least vaguely familiar with, as was the case with Bass’s essay on Laura Ingalls Wilder, as well as “The Sinatra Doctrine,” Rich Cohen’s piece about the intersections among three musicians–Frank Sinatra, Elvis Presley, and Sid Vicious–and a song–“My Way.” Or else they took me into a world with which I have no experience, as Michelle Tea does in her story of Camp Trans and as Paul La Farge does in “Destroy All Monsters,” a story about the rise of Dungeons and Dragons and the man behind the myth-making. La Farge’s piece is particularly interesting because he does something to get around a barrier I faced with several of the essays in this book. He begins with a note to the reader explaining that the first half of the essay is a manual that will orient readers to the world of D&D. The second half is a scenario about the author’s own trip to play D&D with its creator, E. Gary Gygax. He recommends that those who know the game already just skim or skip the manual and focus on the scenario. Thus, he sidesteps the problem of having to orient readers to the game without boring avid players. It’s a tidy solution to a messy problem, but certainly not practical in all cases. Several of the essays failed with me because I didn’t have the background knowledge needed. I haven’t even heard of Manny Farber, much less read his film criticism or seen his art, and Franklin Bruno’s essay, “In Praise of Termites” seemed to require at least some sense of Farber’s place in contemporary culture. I have read Nathaniel West, so I had slightly better luck with “The American Vicarious” by Jonathan Lethem, but my memories of reading West are so vague that my understanding was only slight. I can’t really fault Bruno or Lethem for leaving me out in this way–writing a “manual” on West or Farber would be silly. And not every essay about a writer or artist ought to be a primer on that person’s work. Sometimes you have to assume a general knowledge, and these authors (or their editors) assumed that the audience of The Believer would know enough to follow their essays. I didn’t happen to have that knowledge, but not every essay out there needs to be pitched to my level of understanding. As an editor, I have to consider these questions a lot. What terms will our readers already know? If we define everything, it could seem that we’re talking down to them, yet clarity is essential. Walking that line can be a challenge, and this book reminds me that it’s a challenge for those of us who write about literature as well. For example, if I’m going to review a Victorian novel, I might want to set that novel against others from its period or against other works by the same author. So if I’m writing about Agnes Grey, I might also want to discuss The Tenant of Wildfell Hall or Jane Eyre. What can I assume readers know about those books? Even here I’m assuming readers will recognize that Tenant is from the same author as Agnes and Jane from the same era, the same family even. I tend to assume that our readers have a solid general knowledge of literature and therefore would pick up on the connection without my spelling it out, although if I find a way to sneak a mention in, I might. As a blogger, I can know at least some of our audience through comments, which is helpful in getting a sense of what our readers tend to know. So with all that in mind, I can’t get too frustrated when I come across an essay peppered with references I can’t follow and assuming knowledge I don’t have. 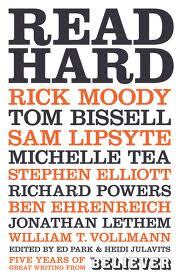 As it happens, most of the essays in Read Hard were pitched about right for me. I don’t read many articles from the magazine online because I find such long pieces difficult to digest online, and I don’t see myself subscribing to the magazine because not all their articles fall quite in my area of interest. But I will certainly make a point of at least checking the contents when I go for a newsstand browse. Perhaps I’ll even take home a copy once in a while. The difficulty of pre-knowledge is really interesting. I guess we are making judgements about this all the time on a daily basis, in conversation. At work, as an archivist often explaining the context of the documents I look after, I’m constantly adjusting the pitch and content of what I say. I know how mortifying it is to misjudge either way, particularly if I’ve made a wrong assumption about someone. (The most common misjudgement for me, unlike most people in real life, is whether someone can read Latin or not…) I find it is worse if I underestimate someone’s knowledge rather than overestimate it, so my position now is to only fill in the specialist blanks and wait to be asked for clarification on other things. This doesn’t always work though, especially if I’m writing to someone as they may be too embarrassed to ask. Its a fraught situation! I know how many times I’ve stood blithely nodding away not following a word because I don’t possess the correct terms of reference. I don’t mind a bit of confusion in my reading – I quite often enjoy reviews of books on specialist subjects I know nothing about – and I always know google is there to help me if I need to supplement the text in some way. But what I hate (and probably what my researchers hate) is when I am made to feel stupid or excluded by the fact that I don’t have a particular knowledge set or haven’t had a particular cultural experience. The problem is when you read an article that actively puts up barriers or hurdles to surmount to understand it. So for example I recently read an article in a mainstream literary review about the poetry of late antiquity. It quoted significant chunks of Latin text but didn’t translate it. That effectively tells all non- Latin readers to keep out. And in the uk, because of the way our school system works, effectively cuts out anyone not educated privately. It made me really agitated! Yes, it’s the feeling of being stupid that’s a problem when something is over a reader’s head. I’ve read some pieces that I do think are being deliberate in taking that stance when people do have different life experiences and can’t help what they don’t know–none of us, after all, have time to extensively research everything we’re curious about! The thing with the essays in this collection is that some were clearly written to pull people into a world they might not know anything about, and I think they managed not to talk down to readers with more knowledge, especially given that a lot of them (particularly the Camp Trans one) recounted a particular experience. But I can’t decide whether the ones that didn’t succeed in getting past my own ignorance would have been better essays if they had done more to draw me in. Better for me, maybe, but better overall? I don’t know. But, to the authors’ credit, they didn’t make me feel stupid for my ignorance. I like the way reading online (although, like you, I tend to avoid longer things) largely derails some of the problems of addressing a general audience. As you point out, you know something about many of the people who read and comment, and the commenters can ask for more information at their moment of reading. And as you also point out, your audience can open another window and look up anything they don’t “get” enough to follow the narrative thread. Like Victoria, in person I sometimes stand blithely nodding, pretending I understand a word or a reference that I don’t really get. Inside I am waiting to be able to get out my phone and look it up. The ability to immediately look up what we don’t know is a huge help when reading online. Although, to be honest, most of the essays that didn’t quite work for me here also didn’t pique my curiosity very much. But if I’d been reading them online, I might have looked a few things up and gotten more interested, because it’s so easy to do that. I was a tech writer for many years and gauging the reader’s knowledge/experience is an on-going battle. We would often use the overview method–the first chapter would cover background for new users; existing users were advised to start with chapter two. But it’s always a compromise. As for magazine reading on-line: I never used to read much long-form magazine work on my computer. I just couldn’t sit still long enough, I guess; but I find that since I got an I-phone with Internet access, I read lots of magazine articles. Perhaps it’s the portability or the convenience, but I read a lot more on my phone than I ever did on computer. I like that method for books–and the D&D piece seemed to work the same way. But with articles, space is a challenge. I just got a smart phone, and I’ve been saving long articles to a Pocket queue for reading when I get snatches of time, and I have liked that. Pocket strips away a lot of the distractions, and reading on the phone is a little closer somehow to the experience of reading on paper. This sounds fascinating. I don’t read The Believer regularly, but I’ve read bits here and there and like a lot of it. I may seek this out just for the (probably few) essays that will be about something I’m familiar with. I think it will be worth it just for the one about Laura Ingalls Wilder. I’ve often found articles in True Believer that intrigue me, but, like you, not often enough to subscribe. It’s a pricey little magazine. I will look for this anthology, though. Just about every one you mentioned sounds interesting. I consider confusion to be a part of reading. I tend to power through it as much as I can. I like anthologies like this because they so often collect the best stuff from publications I otherwise don’t have/make time for. And yes, I usually power through when I’m confused. Sometimes it ends up coming together in the end. It never did with a couple of these essays, but I don’t think they were written for novices to those bits of culture, which is OK.